In a recent post, Michele walked you through the process we use to extract DNA from the saliva samples sent to us. This week, I thought I’d talk a bit about what happens next, how we get information from the DNA. There are many different types of information we can from DNA, but the most commonly used and discussed is genotype information. DNA is comprised of four bases (ACGT) in a sequence, this is what we’re talking about when we say “genotype”. The vast majority of these sequences are the same from one individual of a species to the next. So, in our context, the majority of DNA sequences are the same from one dog to another, and therefore aren’t very informative. What we’re really interested in is the differences between dogs. Individual locations in the genome where the base varies across the population are called SNPs, short for “Single Nucleotide Polymorphisms”. This is a mouthful, but broken down, the term describes exactly what we’re looking for. 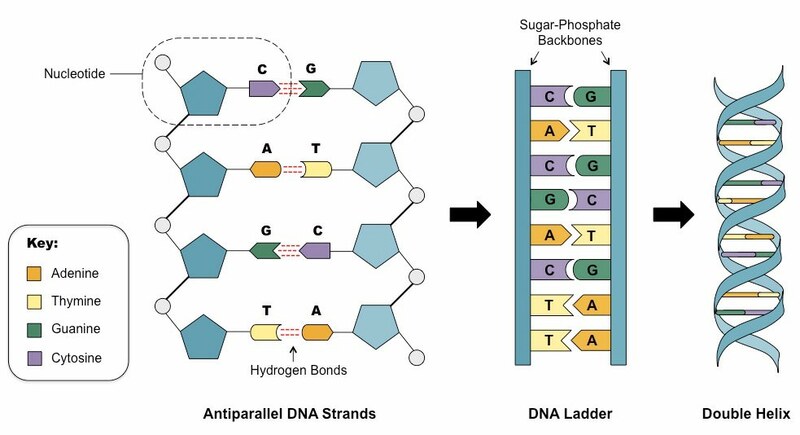 A nucleotide is the basic unit of DNA, which includes both the sugar/phosphate backbone that forms the long chain, and the base (ACGT) that form the rungs of the ladder in the familiar double helix images. Polymorphism simply means that there are many (poly) forms (morphs). So, taken together, we have a single position where there are many forms of the nucleotide, or, a position in the genome where different individuals can have different bases. 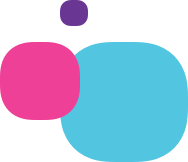 We refer to an individual’s base at one or more of these SNPs as his or her genotype, and genotyping is the process of determining individuals’ genotypes. How do we determine a dog’s genotypes? When we look for the genetic basis of a given trait, or disease, we generally don’t know where we should be looking, so we cast a wide net and look over the entire genome. 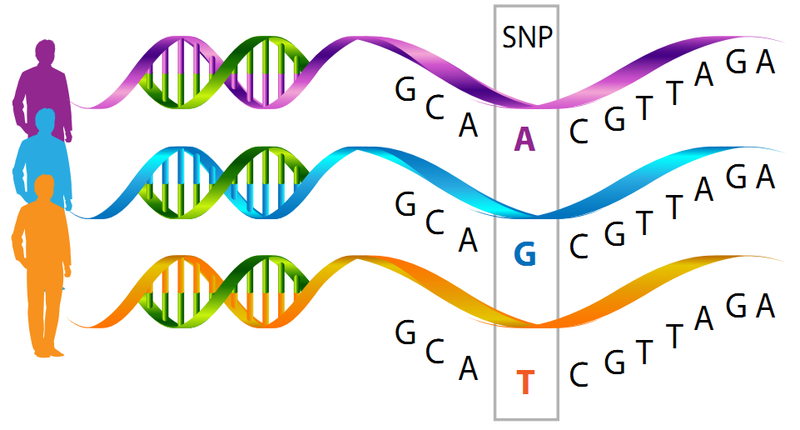 The most common way to genotype across the whole genome is a genotyping array. DNA is double-stranded, with each strand a mirror image of the other; T binds with A, G with C, and so on. A strand of DNA will bind most strongly to a partner that matches it exactly. If you pull the two strands apart, they will naturally be attracted back together where the bases complement each other. You can think of each base as a tiny magnet that specifically attracts its partner. The binding is strong, and forms naturally, but it can be broken and reformed without causing permanent damage, just as you can pull apart two magnets without damaging them. Genotyping arrays exploit this property. On the surface of an array, many millions of short DNA strands are grown in tiny clusters called “features” each feature represents one version of an SNP, and each DNA strand within a feature is identical. On a given chip, there can be millions of features. Allowing us to represent hundreds of thousands of SNPs, in all of their variations. All of this is done on a chip that’s only about an inch across! Purified DNA from saliva samples is fragmented, amplified, and tagged with a fluorescent marker. This tagged DNA is washed over the chip, where it will bind with the DNA strands in the features. The chip is then washed, and only the DNA that matches the features on the chip perfectly will bind strongly enough to stay attached during the wash. Next, a laser is shown onto the chip, causing the fluorescent tags to light up. Pictures are taken and we can tell the genotypes across all of the SNPs for a sample by looking at which features on the chip light up, and which do not! Even looking at several hundred thousand SNPs, we’re missing a lot of the variation between dogs, so there’s a good chance that we won’t have the SNPs underlying whatever trait we’re looking for on our array. fortunately, we can get a pretty good picture of what’s going on, thanks to the way DNA is passed from one generation to the next. When we inherit DNA from our parents (whether Lutheran or Labrador) we inherit roughly 50% each from our Mothers and Fathers. This happens in large chunks, meaning that blocks of DNA get passed down. The closer two sequences of DNA are to one another in the overall sequence, the more likely they are to be passed down together because they’re more likely to be on the same block of DNA. This means that if we have enough SNPs represented in our genotyping array, and enough dogs, we should be able to narrow down the regions of the genome associated with our trait. As whole-genome sequencing continues to get less expensive, eventually genotyping arrays probably won’t be used as much. For the time being, they remain a popular first step. To learn more with what we do with all of this data check out Jason’s blog post here.